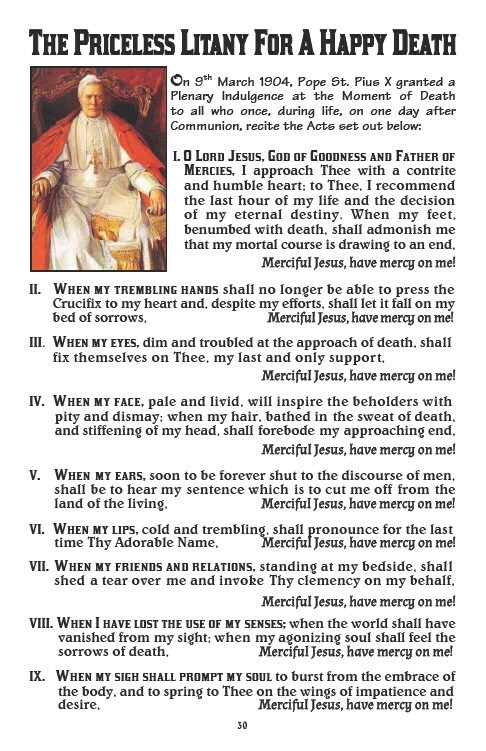 30 On 9th March 1904, Pope St. Pius X granted a Plenary Indulgence at the Moment of Death to all who once, during life, on one day after Communion, recite the Acts set out below: I. O Lord Jesus, God of Goodness and Father of Mercies, I approach Thee with a contrite and humble heart; to Thee, I recommend the last hour of my life and the decision of my eternal destiny. When my feet, benumbed with death, shall admonish me that my mortal course is drawing to an end, Merciful Jesus, have mercy on me! II. When my trembling hands shall no longer be able to press the Crucifix to my heart and, despite my efforts, shall let it fall on my bed of sorrows, Merciful Jesus, have mercy on me! III. When my eyes, dim and troubled at the approach of death, shall fix themselves on Thee, my last and only support, Merciful Jesus, have mercy on me! IV. When my face, pale and livid, will inspire the beholders with pity and dismay; when my hair, bathed in the sweat of death, and stiffening of my head, shall forebode my approaching end, Merciful Jesus, have mercy on me! V. When my ears, soon to be forever shut to the discourse of men, shall be to hear my sentence which is to cut me off from the land of the living, Merciful Jesus, have mercy on me! VI. When my lips, cold and trembling, shall pronounce for the last time Thy Adorable Name, Merciful Jesus, have mercy on me! VII. When my friends and relations, standing at my bedside, shall shed a tear over me and invoke Thy clemency on my behalf, Merciful Jesus, have mercy on me! VIII. When I have lost the use of my senses; when the world shall have vanished from my sight; when my agonizing soul shall feel the sorrows of death, Merciful Jesus, have mercy on me! IX. When my sigh shall prompt my soul to burst from the embrace of the body, and to spring to Thee on the wings of impatience and desire, Merciful Jesus, have mercy on me!